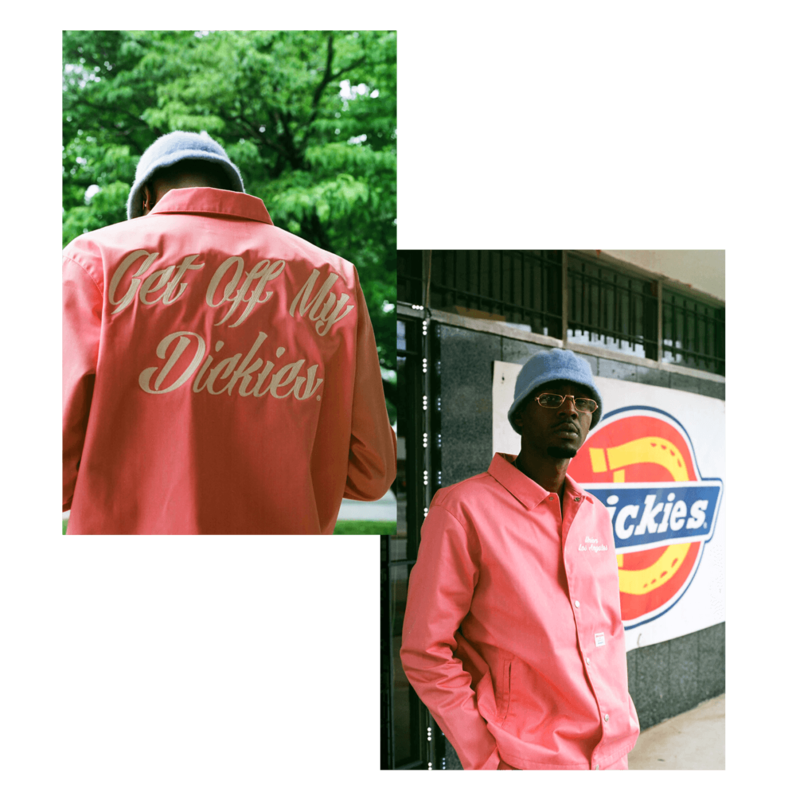 In the early 2000s, Dickies workwear emerged onto the Atlanta Hip-Hop scene becoming a staple brand in our wardrobe. Artists like Crime Mob, T.I., Ludacris, OutKast and more, rocked them on stage or in their videos. From school uniforms to the colorful snap ‘n roll squads, the skate crews, or even matching outfits at the mall for picture day – Dickies made quality gear that was durable and fresh. In the Spring of 2004, Southwest DeKalb Marching Panthers, the band featured in the 2002 hit movie Drumline, dressed their 300+ ensemble in blue coveralls for Jamboree (a battle of the bands but way more turnt). In gold airbrush, many musicians painted nicknames as well as class year on the back of their suit or pant leg. This sold out annual event highlighted the best of Metro Atlanta’s high school band program which outgrew it’s origin at Halford Stadium, transitioning to the Phillips Arena. 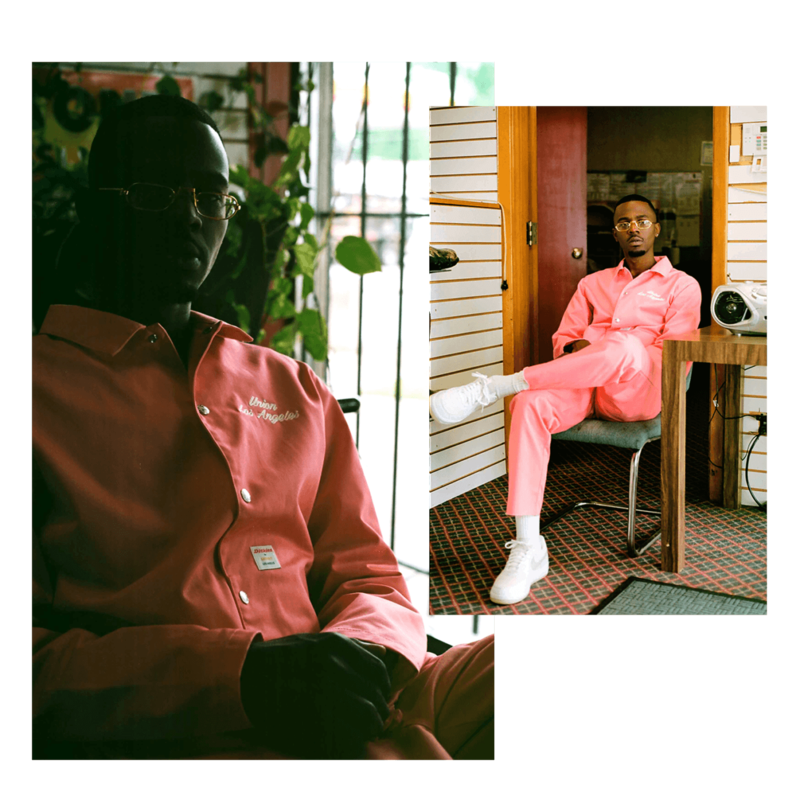 When I got word that UNION had a collaboration with Dickies, I knew I wanted to somehow capture the essence of home. 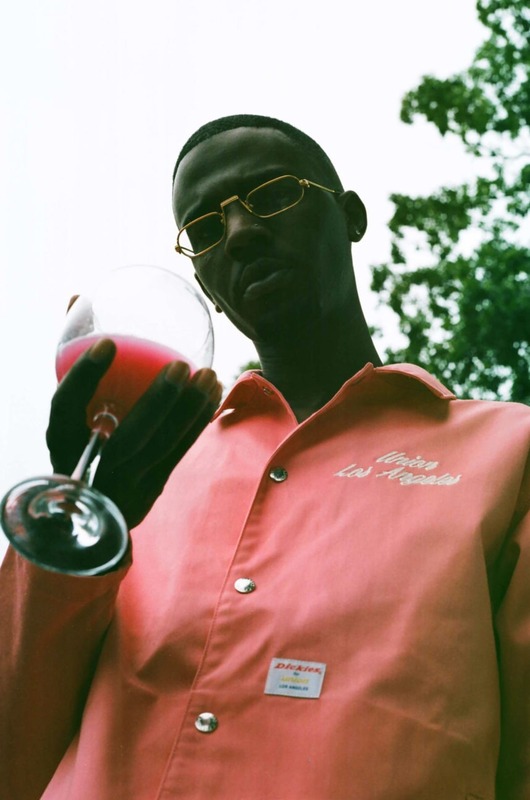 I flew to Atlanta and reached out to my boy Trillaveli, the southern Rap Style Archaeologist, to collaborate on an editorial. I hadn’t quite decided on a location but Trillaveli suggested the Dickies store off Moreland Avenue. This was right, I’d completely forgotten about the shop tucked away on the outskirts of East Atlanta Village. Trill mentioned he’d been eyeing that spot for a minute now. “Say less..” – the next day we made it happen. Upon my arrival a landscaper mowing the lawn greeted me with what was sure to be a 3x tall white-t. The 40 year old Dickies store, formally known as Ross Unlimited Big & Tall, carries sizes 28-86! We’re talking a whole lot of Dickies here. Ms. Marry & her sister Dee-Dee who run the shop welcomed me in for a tour. The scene was perfect, wood paneled walls & burgundy checkered carpet screamed Old Atlanta. 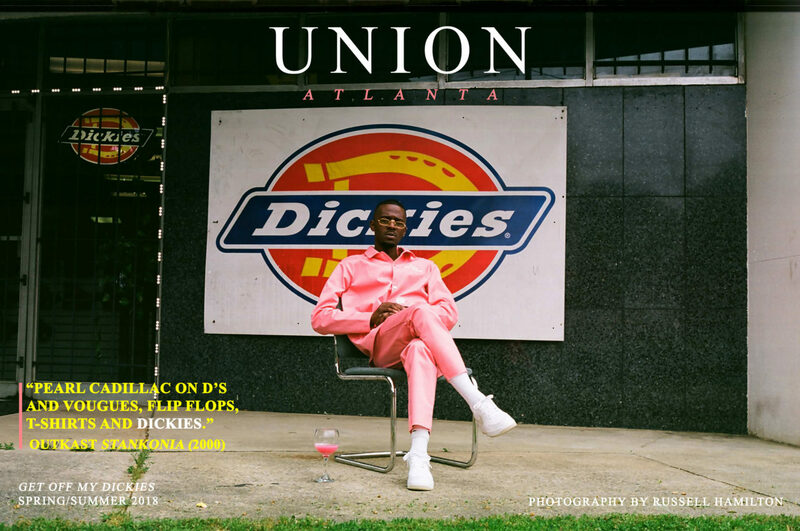 I brought the UNION x Dickies collaboration to Ms. Mary’s attention after purchasing a pair of bottoms. “Ms. Marry, would it be okay to shoot out front?” she warmly responded, “Not a problem, baby..these are beautiful! 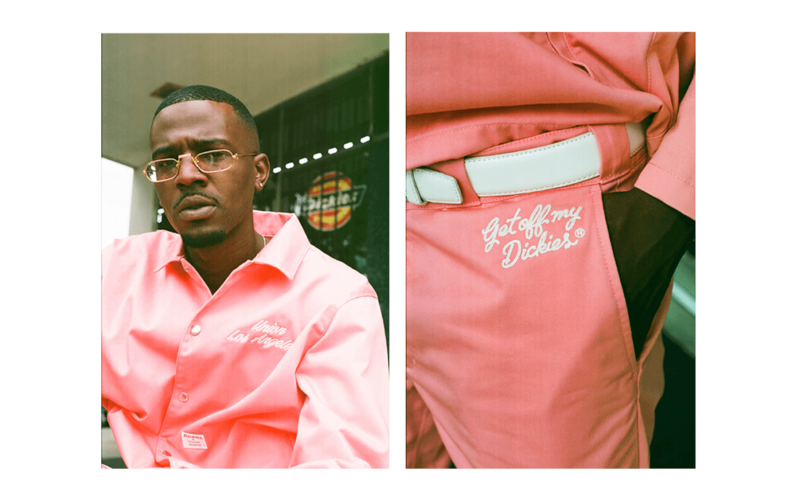 “Get Off My Dickies”, I like that..”. Ms. Mary mentioned we were doing a good thing. Once Trill arrived we got straight to work. An overcast afternoon made perfect lighting for the pink color way. The fit was solid. Shooting with Trill is always classic. He brought a wine glass as a prop & we filled it with SoBe, a popular summertime fruit drink from back in the day. 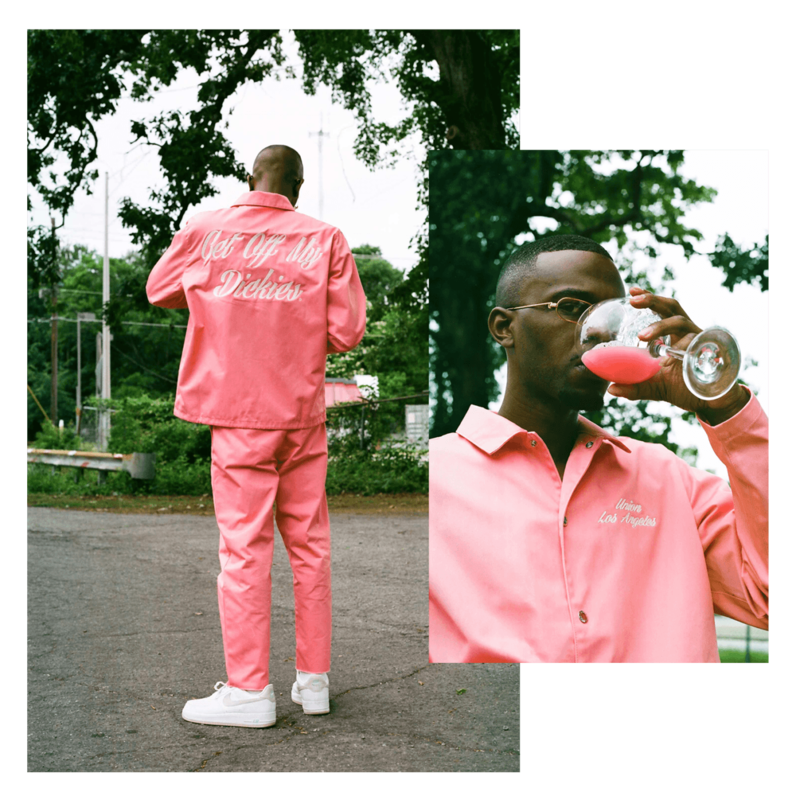 In Southernplayalistic fashion we po’d up; a toast to the A-Town. I believe to know Atlanta is to love Atlanta. Appreciate it for all the character & historic influence. Going back home definitely reminded me about the simple life & the joy of sweet Southern Hospitality.